When formula feeding, sterilizing the bottles becomes a nightly ritual for a whole year (uugh, I'd much rather have my feet up watching Corrie!) so you have to be happy with the equipment you use. I used an electric steam sterilizer when we had Isla 2 years ago and I decided that we'd do the same this time with Noah. I'm not against cold water sterilizing (very handy for when out of the house at my parents or on holidays) and I've never actually tried a microwave sterilizer so have no idea if they're any good, but I'll stick with what I know! Steam Sterilization is also the most effective at killing harmful germs. I was sent the Philips Avent 3 in 1 Sterilizer to review and as soon as I switched to formula feeding I got started using it. So, what's all this 3 in 1 business about? Well the machine has two baskets, and the idea is that you can use the big basket alone, or the small basket alone or use them both together stacked. In the early days with baby when there are more feeds you would use both baskets, but as the feeds drop then the need for both baskets would disappear. It's a great idea really. The machine is very streamlined and doesn't take up a lot of worktop space - which is at a premium in my kitchen. The blurb says that it is suitable for all bottle types and as I don't use Philips Avent bottles, I wanted to know if I could easily fit my Tommee Tippee bottles in the baskets, and I'm pleased to say that I could get 5 bottles in there - which is all Noah needs in 1 day. They are pretty wide bottles but there was plenty of room. Obviously if we'd been using the straighter Philips Avent bottles then we'd have been able to fit 6. Another important thing to consider when considering which sterilizer to buy is how long it takes to actually complete the task - this one takes 6 minutes which is pretty speedy - all good there then. My gripes with the machine are that firstly the heating unit has the power lead going directly into it as opposed to having a one that you can detach. This makes it a bit of a pain when draining the water away from the water reservoir. A detachable power lead would be a much better design. My second niggle is that the machine is that there is no display on it telling you how long ago the unit was switched on, so say if I put the bottles on to sterilize and my partner didn't realise then he may think they're not done and do them again or he may think they are done when they're not. And my final gripe is that the heating element has tended to burn dry even when we've put the right amount of water in the reservoir. It has caused the element to discolour slightly. This hasn't affected its function though. All in all, I would recommend the Philips Avent 3 in 1 Steam Sterilizer to new mums who are formula feeding. 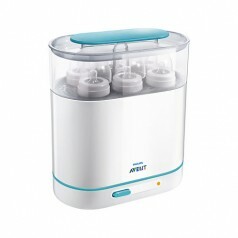 The Philips Avent 3 in 1 Steam Sterilizer retails at £59.99. I was sent this product for free in order to write a review. My review is nothing but honest!